Can You Write Your Own Legal Will in Pennsylvania Without a Lawyer? A legal will assures that your assets are distributed, upon death, to family and close friends in the manner that you desire. Though not required, because of the possible complexities of your situation, an attorney is highly recommended to help draft the will. Special consideration must be made to Pennsylvania will requirements when drafting a legal will without the help of an attorney. These provisions allow wills to be less likely to be contested in court and provide a fair allotment to surviving spouses. An individual must be at least 18 years old and be of sound mind to make a legal will in Pennsylvania. Sound mind means that the individual is not mentally impaired at the time the will is created; the individual must understand the definition and purpose of a will. All legal wills must be made in writing, signed and dated by the owner of the estate, known as the testator. If the testator cannot sign the document, a designated individual may sign on his behalf only by a signed consent of two witnesses. These witnesses must have signed an oath of affirmation as to the validity of the events. A legal will should name an executor that carries out the instructions of the will and assure that they are followed after the creator's death. However, if the deceased did not assign an executor, the court will appoint an administrator to distribute the estate's assets. Depending on the situation, the administrator may be a bank or a trustworthy individual. A Pennsylvania legal will does not require the signature of a witness, although it does help prove its validity. Attorneys usually add two credible witnesses to prevent contesting of the will. However, another method of providing validity to the document is to have the document notarized. This will allow you to have a trustworthy individual, who in most cases is not related to the creator or included as a benefactor in the will, serve as witness. 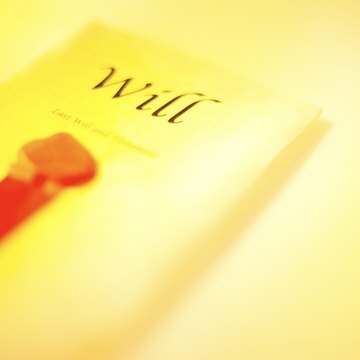 A will is not filed with the Pennsylvania Register of Wills Office until the creator has passed away. This allows a person to change or update her will anytime she wishes. It's a good ideea for testators to make copies of the legal will for family members, a close friend, doctor, attorney and/or member of the clergy, to assure that the will is honored. Although a court will want to honor a legal will to its fullest intent, Pennsylvania Code allows surviving spouses to contest a will if it does not mention them or provides them with too small a quantity in assets. In such case, a spouse may file for a forced share. A forced share allows a spouse to receive one-third of the property mentioned in the will. Pennsylvania Code does not differentiate between the length of time of a marriage, unless a spouse abandoned or neglected the deceased a year or more before the decedent's death. A will is disregarded if it was made before the decedent was married to the surviving spouse. However, the legal will is honored if there is evidence to prove that the will was created in anticipation of the marriage or the will actually gives the surviving spouse a bigger share than the default distribution of assets. Provisions that include a former wife are disregarded if the will was created before the deceased was divorced. A spouse loses her right to the decedent's estate upon divorce. If you are named as executor in a will in Georgia, you have a duty to follow the procedures outlined in the Georgia code, which include promptly filing the will with the probate court. If you fail to fulfill your role as executor, you could be liable if beneficiaries are financially harmed by your delay -- and you may lose your right to serve as executor. Therefore, it is in your own best interests, as well as in the best interests of the beneficiaries, to avoid delay and file the will as promptly as possible following the death of the will maker, known as the testator.